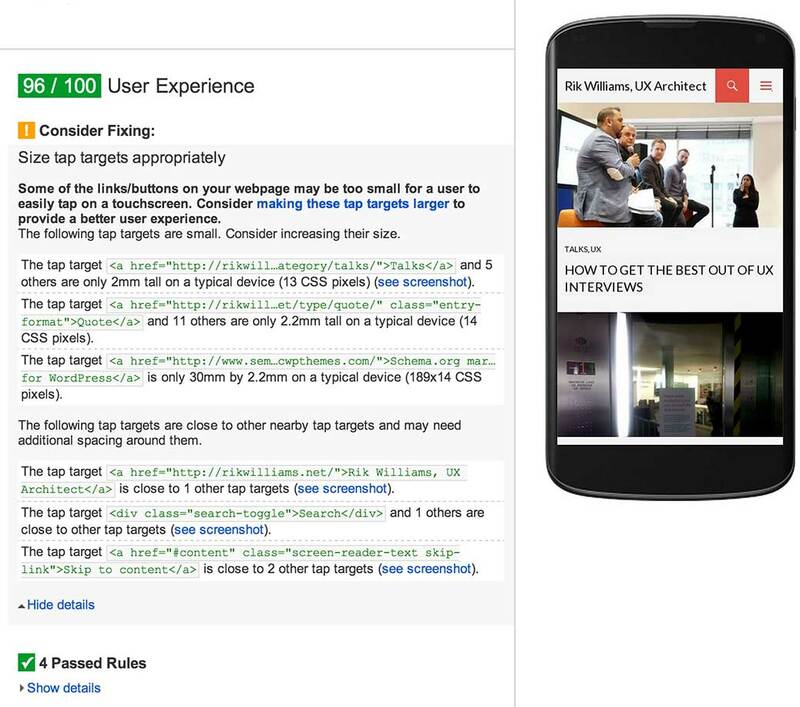 Google has extended their PageSpeed Insights tool to include machine tests for aspects of the quality of mobile UX. Suggests that future PageRank algorithms will increase their onus on UX, in concert with query relevance. Currently in beta and does not affect your score. Whilst this is currently in beta, and does not count towards your score, it suggests that Google is considering increasing the onus it places on UX when considering whether to serve your content in a SERP. I assume that this means that the PageRank algorithm will eventually be updated to down-weight results from sites that do not render properly, or perform poorly, on mobile devices. Building a site or application that is perceived to be fast to download and to render will dramatically affect conversions and experience. The latest data from a 2014 Radware Report, suggests that 57% of users abandoned pages that took longer than three seconds to download (median download time was 5 seconds). Furthermore the median load time for the top 500 ecommerce sites has slowed by 21% year-on-year. Consequently building sites and apps that are fast and which are optimised for mobile use will help place your content ahead of the competition; both in practice and in Search. Ultimately serving content in sympathy with user tasks, scenarios and contexts of use is just good web publishing practice if you want to succeed on the web. In this regard web performance for UX is similar to factoring for the needs of diverse users and their accessibility requirements. It’s simple to do, guidelines, like WCAG and BS 8878, exist to provide practical assistance in compiling with best practice, the benefits are likely to extend across many audiences and they may be expensive to retrofit. What does PageSpeed Insights UX beta test? I assume that PageSpeed Insights uses an interpretation of Fitt’s Law to check whether the links, or buttons, on your webpage can be easily tapped on a touchscreen. This aspect of mobile UX is similar to factoring access issues, like motor-control impairments, or use-case scenarios, by ensuring that the interface is operable through suitable target sizes for its controls. Essentially: you will be penalised if you place the burden on the user to find and install Flash, Silverlight, Java or any other proprietary software to serve your content. This suggests that Google advocates the use of native and open web technologies, like HTML5, to support rich media across all devices. The viewport is the actual viewable area of a browser window, including any chrome from the application itself. Google prefers content that can be served in manner that is in sympathy with the constraints of the users device. In practice this means using responsive design rather than an “m.dot” custom mobile site. They also require that you explicitly configure your metadata to instruct the browser to control the pages dimensions and scaling so that it fits the users screen properly. Pretty straight forward to understand, and a final example of how usability, accessibility and mobile optimisation intersect.